As students start going back to college, they are downloading Kno’s new Textbooks app for the iPad in droves. It is currently the No. 1 iPad education app, No. 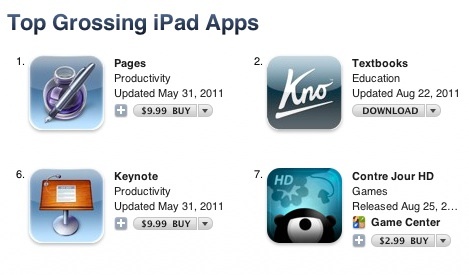 2 grossing iPad app overall, and a top-25 free app (more popular than even the Kindle iPad app). The app is being downloaded once every 8 seconds. The map above depicts downloads over the past 24 hours. The app itself is free, but then Kno sells digital college textbooks as in-app purchases. Know currently offers more than 100,000 textbooks, which can be annotated, highlighted, and also be read on the Web or Facebook. After abandoning its own oversized textbook tablet, Kno released its digital textbook reader and store on the iPad last June. In recent weeks, Kno added a bunch of new features such as automated quizes, an activity stream of notes, integration with Khan Academy videos online, and 3D models of molecules generated on the fly. The colleges with the most Kno students so far are ASU and the University of Arizona, Harvard, and UT Austin. The early numbers suggest a strong start for Kno this semester, it’s first real availability among students. The appeal of downloading textbooks to your iPad instead of lugging around paper copies in your backpack is obvious. It doesn’t cost anything to download the app, and paying for one or two textbooks to try it out is fairly low risk for most students. Kno’s real test, however, will come later in the semester when early users decide whether to download more Kno textbooks or head back the the campus bookstore.